Behind Summit mall and Merchant Square. Are you ready for a NEW experience in the Akron/Fairlawn Area? We have the answer! This is a great place to have fun with your friends, or meet new friends; relax or just let your hair down and be you; or simply discover your inner artist. Bring your favorite bottle of wine or beverage, and paint along with our artist to create your own work of art that you will take home at the end of the evening. Two hour classes are offered for $35 and three hour classes for $45. Select Family Friendly classes offered for $25. Advance Reservations Required. Parties for adults or kids are great for groups of 12 or more. We are BYO. Food is permitted. Alcohol is NOT allowed during family or kids classes.Guests 21+ bring beverage(s) of choice per local restrictions. Ages 7 & up are welcome to attend Family Days/Kids Classes. All classes 5pm and later are strictly 18 & older. Ages 15 & up are welcome to join any 2 hour class before 5pm if accompanied by an adult. No infants, toddlers or observers allowed in any class. Did you know our October calendar is live? We're looking forward to celebrating all things Fall! Pumpkins, Hot Cocoa, Pumpkins spice everything, Sweetest Day, Halloween, Witches, Wizards, Black Cats and Monsters! 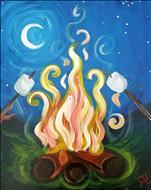 Call your friends and join us for one of our painting parties. No experience necessary to have a great time, our artists will give you all of the tips and tricks to create your masterpiece. Get a head start on planning your holiday parties, dates are filling up fast. Email the studio to get your party on the calendar! Is it me or did summer last like 10 minutes??? Are you looking for something fun to do with your kids before school starts? We are happy to add an afternoon class for a group of 6 or more! How about a first day of school mom's get together?? Whether you're the type to celebrate the beginning of the school year or one sorry to have the kids gone all day, grab 5 friends and plan a Coffee and Canvas! Or if Wine is more your thing, a Palette and Pinot party! We have so many choices for your group to choose from in our library of over 12,000 copyright protected paintings, wine glasses, wood pallets, Rebecca Flott Arts Screen Paintings, canvas sizes from mini's up to extra long or extra large!! And as always, you can change your painting to fit your design or decor!! We have the brushes, paint, canvases and everything that you need to feed your inner artist or discover your creativity!! See you in the studio! Hot, humid summer days and nights are here! 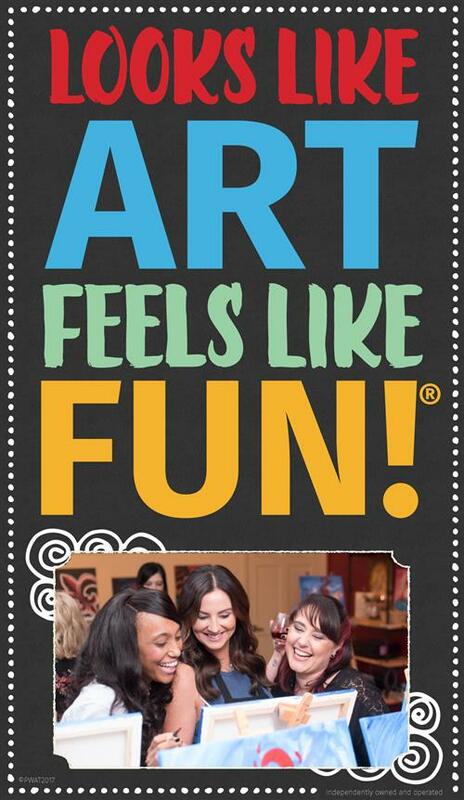 Escape the heat and join us to feed your inner artist. Never painted before? GREAT! 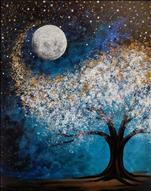 Our talented local artists will guide you step by step through your painting. Want to paint something different from the scheduled painting? GREAT! 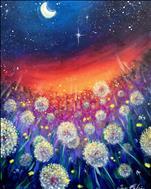 You are always welcome to join us and paint anything that you choose! Just let us know what paint colors you would like and we will set you up! Want to choose your own painting? GREAT! 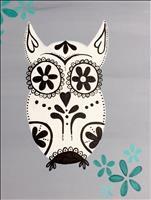 Grab 5 friends and we will schedule a class for your group where you can choose the painting! Private Events always get to choose their favorite painting! 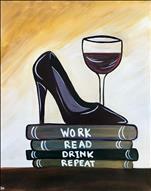 So if your favorite drink is wine or soda, we will supply the canvas, paint pallet, brushes and everything you need to create your masterpiece! 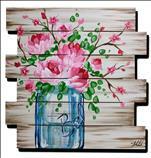 Prefer to paint on a wood pallet? GREAT! We have those too! Our NEW extra long canvases create a great base for a gallery wall. Mix your favorite square canvases with extra long canvases, wood pallets, Rebecca Flott ARts Screen Art, Giant 24 x 36 canvases to reflect your design style. 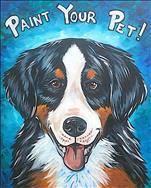 Our always popular Paint your Pet class is back! 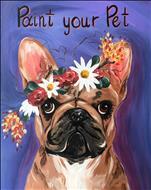 Paint your fur baby or one as a gift for your loved ones. It's never too soon to start planning for Christmas gifts. Father's Day is approaching and Dad would love a custom painting from his favorite artist.